The countdown is on! 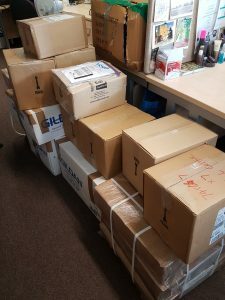 With just two weeks to go now until EuroCALL 2017, there is a buzz of anticipation in the air amongst EuroCALL committee members and colleagues, and a growing pile of goodies next to Committee Member Erin’s desk, as we await the arrival of our presenters and delegates from across the world! Tuck into our 25th anniversary biscuits during a networking coffee break! Take some time out during your time in Southampton with a visit to Sea City and Tudor House and discover more about Southampton’s rich maritime history. If have not already booked your place, there are still tickets available (please contact Erin Forward on eurocall2017@soton.ac.uk). Join in and show us how it’s done at our Ceilidh event at the conference dinner on Friday night at St Mary’s Stadium. Many delegates can also take in the sights of the stadium with a tour and chance to see behind the scenes of the Saints’ home ground! With our team of dedicated helpers who will be dotted about the campus, there will be no shortage of friendly faces to ask for help and to make sure that your experience of EuroCALL 2017 is an excellent one! Watch this space for next week’s blog post with tips to help you find your way around the University of Southampton campus and make the most of being a delegate at EuroCALL 2017.